THIS ARTICLE WAS WRITTEN TO PROVE, ONCE AND FOR ALL, THAT WE ARE NOT BEING TOLD THE TRUTH ABOUT THE NASA FILM FOOTAGE OF THE APOLLO MISSIONS. THIS WILL ASTOUND EVEN THE MOST HARDENED SCEPTIC AND CONVINCE MANY PEOPLE THAT THE WHOLE APOLLO MOON PROJECT OF THE LATE 1960's AND EARLY 70's WERE A COMPLETE HOAX. VIDEO LINKS ARE PROVIDED SO YOU CAN WATCH WITH YOUR OWN EYES THE 'OFFICIAL NASA FOOTAGE' THAT PROVES THAT WE REALLY HAVEN'T BEEN TOLD THE WHOLE TRUTH!!! PLEASE NOTE: A new updated version of this article is now in the process of appearing at our new site HERE. Over the next few weeks, this 5 part epic will be added to the site. Part One is available now - please click the link after reading this article for the latest update. All pictures and Movies on this page are either copyright of NASA, Aulis or The Disclosure Project. Before we get into the issue of the Apollo moon landings, I would like to finally show evidence of NASA airbrushing out anomalies on the Moons surface. I have claimed since this website began in 1999 that NASA has been covering up what they have found and filmed on the Moon from lunar orbit and now I have the film evidence to back up that claim. For many years now I have been subjected to flaming from the pro-NASA fraternity, claiming that such evidence does not exist. Well, here's your wake up call! Bill Kaysing was a librarian/writer of technical publications and advanced research at Rocketdyne Systems from 1956 to 1963. He states that it was estimated in 1959 that there was a .0014 chance of landing man on the Moon and returning him safely to Earth. This took into account the effects of radiation, solar flares and micro meteorites. He could not believe in 1959 that man could go to the Moon. However, only 2 years later, American President John F. Kennedy set a goal in May 1961, when he made the following famous speech. 'I believe that this nation should commit itself. To achieving the goal, before this decade is out, of landing a man on the Moon and returning him safely to the Earth. No single space project in this period will be more impressive to mankind or more important for the long range exploration of Space.' It was just eight years later in 1969, that man finally left Earth and set foot on the Moon... Or so we have been led to believe. I would like to show you some astonishing evidence that shows glaring mistakes or anomalies on the 'official record' of NASA film footage and still photographs. I have included the actual official Apollo film footage on this page to illustrate and also possibly educate you, the reader, of the anomalies and to let you see with your own eyes what has become one of the biggest cover-ups in the history of Mankind. I will also explain why the US Government has tried to keep this a secret for over 30 years. I would like to suggest that if Man did go to the Moon during the missions, the Apollo films that we were told were filmed on the Moon are bogus and not the real footage. Evidence suggests that Man could not travel to the Moon's surface, but instead they had to stay in near Earth orbit within the safety of the Earth's magnetic field that would have protected them from the radiation that is emitted by the Van Allen radiation belt!!! But why would NASA and the United States bother to fake such an event and to what cause I hear you ask? Please read on and I will explain. Was man too optimistic about what we could actually do in deep space, and was President Kennedy's speech in May 1961 pressure enough to keep the hoax going? David Percy is an award winning television and film producer, a professional photographer and also a member of the Royal Photographic Society. He is co-author, along with Mary Bennett, of the fascinating book 'Dark Moon: Apollo and the Whistle-Blowers' (ISBN 1-898541-10-8). The majority of the film footage on this page is taken from the film 'What Happened on the Moon? ', a film that also features Percy and Bennett and one which I strongly recommend if you have an interest in the Apollo missions (details of how to purchase the video are at the bottom of this article). Percy firmly believes that the Apollo footage was either faked or not the original film that was shot on the Moon. He believes that many anomalous features that would alert the eagle eyed viewer, could have been placed in the films by whistle blowers who were deeply dissatisfied to be a part of the cover-up. He has studied the entire transfer of the original film on video tape, a feat that not many people have done. What many people did not realize at the time was that a lot of the footage was actually pre-recorded and not live at all. The first anomalous piece of footage I would like to discuss is from the 1972 Apollo 16 Mission. 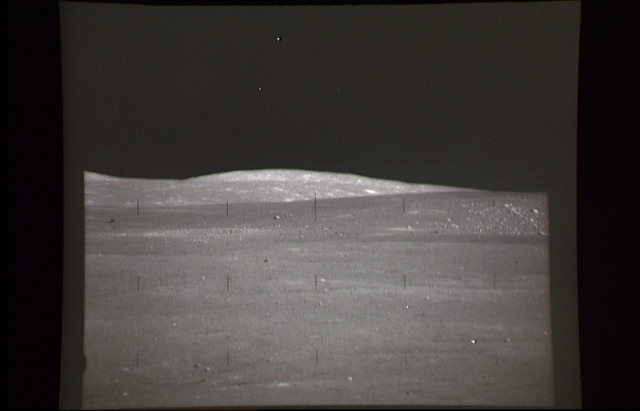 There is a major discrepancy between the still photograph taken with a Hasselblad 500 EL/70 camera and the TV coverage film which was shot from a stationary movie camera placed behind the astronauts. The movie sequence (that is viewable by clicking the picture to the left) shows one of the astronauts making a jump salute whilst another astronaut takes a still photo with the Hasselblad camera. On the still photo (that is pictured left) we see a flap of triangular fabric that has come loose and flapped up behind the astronauts head. However the TV film which was shot from behind the astronaut doesn't show the flap? Why not? Another example that appears to be faked is the footage of Earth taken from the Apollo 11 when it was 130,000 miles away. This is the very first view ever taken of Earth on the mission and it seems strange that Buzz Aldrin would film the Earth when he was stood far away from the window, why would he do that? Surely you would want to get close to the window to get the best picture and also to eliminate light reflections that are evident towards the end of this sequence? But no, we see the window frame come into view on the left of the shot. The camera isn't set to infinity either to get the closest shot. The window frame that comes into shot would have been out of focus if it was. Did the astronauts actually film a transparency of the Earth that was stuck to the window? You may think this odd, but a few minutes after filming the Earth, the cameraman adjusts his lens and focuses on Mike Collins inside the craft. What we see is what appears to be an exposure of the Earth taped to the window that is in the background to the right of him. That is the very same window that Aldrin was filming the Earth. But the biggest shock is yet to come! The camera pans left past Neil Armstrong towards the left hand side of the Apollo 11, and what do we see out of the left window??? We see what appears to be another Earth... Go on, watch the video by clicking the picture above and you'll see it with your own eyes! It must also be noted that the Apollo 11 at this point of the mission was supposedly half way to the Moon. The time elapsed was 34 hours and 16 minutes, but from the view of Earth in the right hand window, we can say that in fact they were not in deep space at all, but still in low Earth orbit! look at the blue sky outside. That would also explain why they would be filming an exposure of the Earth that was far away, to give the impression that they were in deep space. The exposure would be clipped to the window and the Sun's luminance would light it up, a technique that was used to read star charts to help with navigation and star reference. Anomalies with the film footage! Hasselblad were the manufacturer of the camera that took all of the photos on the Apollo missions. Jan Lundberg was the Manager Of Space Projects at Hasselblad from 1966 to 1975 and responsible for the production and building of the Hasselblad 500 EL/70 cameras that were used on the Apollo Missions. He says 'Originally NASA made all the alterations themselves, then they presented what they had done to us and asked if we could do the same, to which we replied yes we can, and we can do it better. We proceeded to make the alterations that were accepted by NASA.' Protective plates were added to the case and film magazine. An important factor to take into consideration is the great variations in temperature that the film would have had to endure whilst on the lunar surface. The temperature during the Apollo missions were recorded as being between -180F in the shade to an incredible +200F in full Sunshine. How could the film emulsion have withstood such temperature differences? The astronauts can be seen to move between the shadows of the rocks and then into full sunlight in some shots. Surely the film would have perished under such conditions? If the film used during the Apollo missions had such qualities as to withstand such differences in temperature, why are Kodak not publicly selling them in today's market? according to NASA, placed on the film to help calculate distances on the Moon. The crosshairs were actually built into the camera and therefore should be visible on every single picture taken by the astronauts on the surface of the Moon. Incidentally, Jan Lundberg has stated that the only way that you could calculate the distance in the shot using the crosshairs would be if you had two cameras set up to take a stereo picture! Take a look at the pictures presented here and you will see that parts of the crosshairs have disappeared from the film. This is impossible unless the film has been tampered with. The crosshairs should be completely visible in all shots and not hidden behind objects in the pictures. The only solution must be that NASA has gone to the trouble of either airbrushing out certain objects in the film, or added them over the crosshairs! Why does this rock have a letter 'C' on it? There is also a 'C' on the ground in front of the rock. The use of the letter C on film props is well known by the people in Hollywood and is used to show where the centre of the scene should be. One sceptic on the Bad astronomy sceptics web group has even said it is a hair??? on both the rock and ground? Now who's trying to cover things up? One of the biggest anomalies that appear on the Moon shots are the way in which shadows seem to be cast in totally different directions, even when the objects making the shadows are a mere few feet apart? A classic example can be viewed by clicking the picture to the right. If the guy on the left was near a vertical rise of ground (as has been suggested) his shadow would show a definite 'crease' where the land begins to rise. It doesn't! Question: How can an astronaut cast a shadow several feet taller than his colleague who is standing a few feet away from him? Answer: He is standing farther away from the arc light that is illuminating them both. I truly believe that this footage is taken on a film set, you cannot reproduce this strange shadow phenomenon with natural light, and that includes taking into consideration two natural light sources (the Earth and Sun) as many sceptics would have you believe. The video on the left contains film footage from the Apollo 11, 12 and 14 missions that would suggest that there are many light sources lighting the so-called Moon's surface. In the Apollo 11 film the shadow cast by Armstrong is strange, the sun angle is estimated at 10 degrees above the horizon. Now compare it with the Apollo 12 footage that shows a longer shadow. The sun is at a 15 degree angle and so therefore the Apollo 12 shadow should have been shorter. In the Apollo 14 footage look at the shadow as it does some truly amazing manoeuvres! this is consistent with moving away from a source of light that is close to the astronauts. Some of the lighting on 'official NASA film' are very suspect. The NASA picture to the left should show the astronaut in complete shadow because the sun is behind him, and yet the whole of the astronaut is caught in bright light? The shot should appear like the one on the right which was simulated by David Percy. I have had quite a few debates on the web about the picture above and the others on this page. I'm told by sceptics that the picture appears as it does because you have to remember that two light sources are present on the Moon's surface (the Sun and Earth glow). I do not doubt that there could be reflective light from the Earth, but, in my opinion, if a light is bright enough to light up this astronauts suit, it is sure capable of also producing another shadow behind him... Sceptics believe that he is illuminated by light reflecting off the Moon's surface. As I've stated elsewhere on this page, the reflectivity is only 7% so the theory of the light bouncing from the surface is highly suspect. If this were the case, the rock on the left of the picture would have hardly a shadow because it is closer to the source where the light is reckoned to be reflecting from! Shadows do not appear to be correct on several of the Moon shots. Take the picture to the left for example. The shadow on the LEM is due East and yet the shadows on the rocks in the foreground are South East? A simulation by David Percy of how the shadows should normally appear is illustrated in the picture to the right. 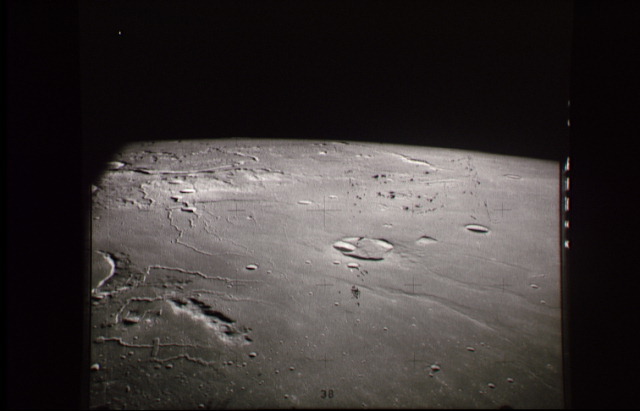 If two light sources are at work on the Moon's surface, they would combine together and the shadows would fall accordingly, not at random points. Unless the sceptics are saying that Sunlight is falling in the middle of the picture and there is Earth light at the forefront of the picture? And that would go against known physics. During the Apollo missions, the movie cameras were fitted with special night lenses to compensate for the lack of light. Due to the atmospheric conditions on the Moon's surface, only 7% of light is reflected from the ground (that's the same reflectivity as asphalt). So, taking this into consideration, how did the Hasselblad stills camera manage to pick up more detail than the movie cameras? NASA have confirmed that no artificial lighting was used on the Moon's surface, so how can the stills camera take pictures that were brighter and sharper than the movie cameras that were fitted with special lenses to compensate for the dark conditions? The picture to the right shows you just how dark a place the Moon is. Look how dark the shadows are on the side of the rocks. Watch the film sequence to the left that has both movie and still pictures to compare the difference. 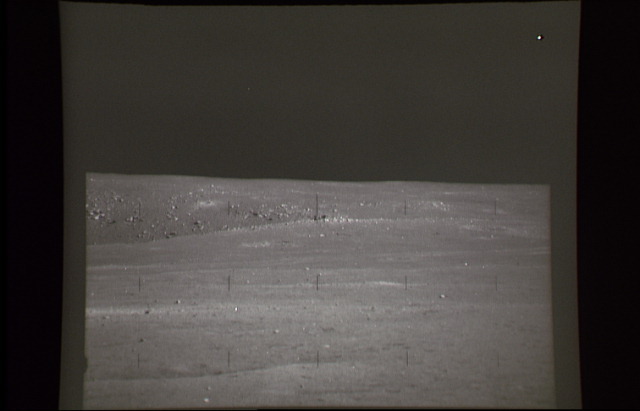 It's interesting to note that the still photos seem to have Aldrin brightly lit, in comparison to the gloomy motion picture images that had the special night lens on it? It appears that artificial lighting was used or has been added to the still photos to show better features on Aldrin's suit and the Lunar Lander. Because of the lack of atmosphere on the surface of the Moon, the shadows would be intensely black. As illustrated in the above motion picture, why is there such a vast difference in the light from the two cameras, unless the still shots were lit by artificial lighting? NASA have said that no lighting was taken to the Moon, but this cannot be true when you view the evidence. The still pictures seem to show that Aldrin is being artificially lit as he descends the ladder. The reflectivity of the Lunar surface is so low, that light does not even reflect onto the rocks that are on the ground, yet the light in these pictures are so intense, even Aldrin's heel protector on his boot is lit up! Dr. David Groves who works for Quantech Image Processing has done some analysis of these particular shots and has used resources to pinpoint the exact point at which the artificial light was used. Knowing the focal length of the camera's lens and being able to get hold of an actual boot, he has calculated that the artificial light source is between 24 and 36 cm to the right of the camera. If the TV footage is actually real, then I could understand this, as the movie images are very dark and grainy, but I believe that the still photographs are definitely faked. Lets move onto the famous picture of Buzz Aldrin that shows the LEM, Neil Armstrong and landing site in the reflection of his visor. One of the strange things with this picture is that the reticule that is supposed to be in the middle of the picture actually shows up at the bottom of Aldrin's right leg? How can this be when the camera is attached to the cameraman's chest??? A fact that is easily verifiable by the reflection of the cameraman in the visor. Many people have speculated that the pictures have been retouched to bring up the detail of the astronauts. But this cannot be applied to the Apollo 11 photographs because a duplicate copy of the original Armstrong film has been analyzed and shows that the pictures are all on one continuous roll of film that contains over 100 images. Even Jan Lundberg from Hasselblad, the makers of the camera, says that the pictures seem as though Armstrong is standing in a spotlight. The only way the reticule could appear in the bottom of the leg is if the picture had been copied and reframed!!! The horizon is about 89 degrees from the true vertical. Dr Groves has worked out that after analysing the shadows cast by both the astronaut in the picture and the supposed cameraman in the visor, that Armstrong who is taking the picture is standing on ground that is a mere few inches higher than where Aldrin is stood, If this is the case, then it means that whoever took the shot was in fact at least 2 feet higher than Aldrin and therefore means that Armstrong, although visible with the camera in the visor, is not the actual person who took the shot. During Apollo 12, one of the cameras suffered a malfunction after the lens had been pointed towards the Sun. As you can see from the sequence here, although the viewing public were told at the time that the camera had burnt out, the lens is still working? the camera didn't actually burn out at all. The very same thing happened on Apollo 15 where the camera's lens didn't burn out. It is interesting to note that during the Apollo 16 mission, one of the astronauts who was being told by Houston to adjust the camera asked if he should point the camera towards the Sun?? even though the manual from the camera specifically points out not to do this? You may be interested to see what the astronauts say on this film while this camera fiasco was taking place. We have to remember that the camera used didn't actually have any viewfinder, and the astronauts could not see the whole of the camera that was strapped to their chests due to the restrictions posed by their spacesuits. They had to use their body to point in the rough direction of their subject. The astronauts even had to change the lens whilst stood outside on the lunar surface, wearing their heavy gloves. A feat that is quite hard to believe considering the very awkward pressurized gauntlets that they were wearing. The precaution of changing the film inside the LEM was not adhered to and could have ended in disaster if the film had actually been dropped into the dust on the ground. And what about the exposure to the heat? It would have been virtually impossible to change the film and adjust the lenses in such apparatus. However in certain films, they do seem to be wearing different gloves that do not seem to be pressurized? How can we see so much detail on the gold portion of the Lunar Lander in this picture? As is evident by the shadow in front of the module, the Sun is in the background and the gold area should be covered with shadow, not Sunlight? And why does the 'Sun' have a halo around it if the Moon has no atmosphere? About being in deep space? This footage shows the Apollo 11 crew pre-recording supposed 'live' footage. Armstrong claims that they are 130,000 miles from Earth, and yet we soon discover that the camera is placed on the other side of the cabin, with the windows blacked out, filming the Earth through the round window opposite. Why would they do this if they wanted the best shot of the Earth? The answer is simple - to fool the public into thinking that it is far away, when in fact the craft is still in Earth orbit. How do we know this? Because just before the camera is turned off, the windows are uncovered to reveal blue sky! In western Australia during the live broadcast of the Apollo 11 moon landing, several people saw a very unusual occurrence. One viewer, Una Ronald watched the telecast and was astonished with what she saw. Bill Wood is a highly qualified scientist and has degrees in mathematics, physics and chemistry, and a space rocket and propulsion engineer. He has been granted high security clearance for a number of top secret projects and has worked with Macdonald Douglas and engineers who worked on the Saturn 5 rocket (the Apollo launch vehicle). He worked at Goldstone as a Communications Engineer during the Apollo missions. 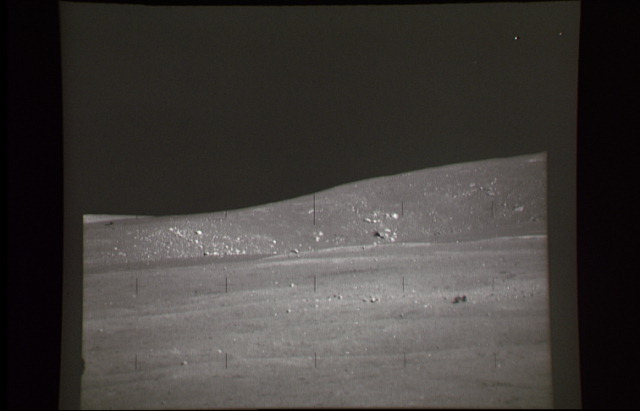 Goldstone in California, USA, were responsible for receiving and distributing the pictures sent from the Apollo to Houston. He says early video machines were used to record the NASA footage here on Earth by the TV networks. They received the FM carrier signal on Earth, ran it through an FM demodulator and processed it in an RCA scan converter that took the slow scan signal and converted it to the US standard black and white TV signal. The film was then sent onto Houston. When they were converting from slow scan to fast scan, RCA used disc and scan recorders as a memory and it played back the same video several times until it got an updated picture. In other words the signal was recorded onto video one then converted to video two. Movie film runs at 30 frames per second, whereas video film runs at 60 frames per second. So in other words the footage that most people saw that they thought was 'live' wasn't, and was actually 50% slower than the original footage!!! This picture from Apollo 15 is really quite an amazing feat of camera work if you consider that it was taken without any means of knowing if everything was in shot. No viewfinder, no one to tell you if everything is in shot. Isn't it strange that the only thing visible on the dark part of the Lunar Lander is the American Flag? You cant put that down to two light sources. More likely a NASA artist and an airbrush! This picture was later used on postcards and NASA advertising. Did you know that the picture to the right is the only close-up picture taken of Armstrong on the Moon... a bit strange considering that he was the first man to step onto the lunar surface. Why only one picture of the first man on the Moon? The lunar lander used two engines stacked on top of one another. The LEM's descent engine used hyperbolic propellants, that means two different fuels that light at the same time. The exhaust jet coming out of the LEM on descent or ascent should have created an enormous cloud of reddish coloured gas, instead we see the bursting apart of the milar covering as it leaves the Moons surface? The fuel used are exactly the same as used on the Shuttle today, and we can clearly see the exhaust smoke coming from them, so why not the LEM? Surely there should have been some type of crater under the Apollo landing modules, especially the Apollo 12, as it slowly moved across the moon's surface before landing. 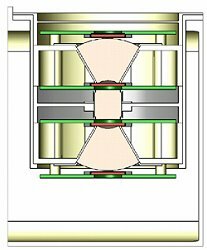 The 5000 degree Fahrenheit heat from the 10,000 lb thrust of the engine should have produced at least some volcanic rock. If you compare the molten volcanic rock at Mount Etna, that was boiled at only 1000 Celsius. I have heard some sceptics claim that the engines force would have been dispersed mainly sideways, but if this is so, what actually held up the 2,300lbs of lunar lander when it was on its descent to the Lunar surface? Why was there not any dust in the landing pads either? There is certainly lots of dust scattered when the LEM is leaving the Moon and if the engine simply blew all the dust away from around the LEM as it landed, how did Armstrong manage to create that famous footprint? Do you seriously believe that Neil Armstrong could land the Lunar Module by trying to judge the terrain below from a very restrictive view of the Moons surface from the small triangular window positioned on the side of the craft? By the time of the Apollo 13 Mission in April 1970, public interest in space travel was beginning to diminish. This could have been partly due to most of the previous Apollo 12 Mission having to rely mainly on an audio transmission, due to the camera malfunctions encountered. Was this a factor in the alleged near disaster on the Apollo 13 mission? Were NASA trying to get back the publics attention and therefore guarantee the continued funding of the US Government? On the 13th hour of the 13th day of the 13th Apollo Mission, disaster struck when an oxygen tank exploded. The film here sees the astronauts from the Apollo 13 just before they transferred to the LEM, the craft is allegeded to be some 200,000 miles from Earth. If we look out of the window we see blue sky? how can this be if they are in deep space??? Surely the windows should be showing black space, unless they are in near Earth orbit of course? As pointed out by Percy and Bennett in 'What happened on the Moon? ', the picture on the left shows the Odyssey after it was damaged by the oxygen tank explosion... the one on the right shows a normal shot of a command and service module with its cover removed from the scientific instrument bay. Do they look similar to you? How could Astronaut Fred Haise state the crew aboard Apollo 13 could see Frau Mauro? At the time of the accident, Frau Mauro, which was to be the original landing site of the Apollo 13, was in darkness and would remain so for the entire time that the Apollo 13 was near the Moon. In fact it did not reappear until 88 hours after the Apollo 13 had left. By this time the Apollo would have been 19,000 miles away on its way back to Earth, making it impossible for any of the crew to see Frau Mauro during the mission . How did NASA recreate the effects of weightlessness??? If the same sceptics cared to double the speed of the film, they would see that the astronauts don't act any differently to how they would on Earth! Lets take a look at some footage that seems to show astronauts suspended by a thin wire. In fact, if you look closely, you will see the light reflecting off the wires above the astronaut. Watch how the astronaut seems to be almost jumping on the spot to turn around in the next sequence, its rather similar to the practice rig used in training here on Earth. In the last sequence of this footage, see how the astronaut who has fallen over, gets up. He stands up without putting his hands on the ground, or the other astronaut helping him. just like a puppet on a string!!! Many sceptics will probably try and convince you that the hammer and feather experiment which was achieved during the Apollo 15 mission could not be recreated in a studio. Well, here is the original NASA footage on the left and on the right is a very similar experiment which is simulated and comes from the 'What happened on our Moon?' video. The simulation is carried out within a 1G atmosphere here on Earth, so that blows that one out of the water. Radiation plays a big part in space travel. Solar flares could have affected the astronauts at any time. The Apollo leaving Earth would travel through 2 specific areas of very high radiation called the Van Allen Belt. The first field is 272 miles out from Earth. The amount of radiation in the belts actually varies from year to year, but every 11 years its at its worst when the sunspot cycle is at its highest. And guess what? 1969 to 1970 was one of the worst times to go, as this was the time where the radiation was at its peak. I have had numerous internet chats with sceptics who say that the radiation would not play a part in the missions because Man would have not been in the radiation belt for too long. My answer to that is, when Dentists or Doctors take X ray pictures they either leave the room or stand behind a sheet of thick lead to shelter from the radiation. Why did NASA only use a small sheet of aluminium to protect the astronauts when they knew that the radiation levels in Space and on the Moon's surface would be many hundreds of times more deadly? And why would they risk their astronauts to such conditions? In 1959 Bill Kaysing was privy to a study made by the Russians. The Russians discovered that the radiation on the moon would require astronauts to be clothed in four feet of lead to avoid being killed. Why didn't NASA heed their warnings? Did you know that the US Government tried to blast a hole in the belt 248 miles above Earth in 1962? During Operation Starfish Prime a Megaton Nuclear Bomb was used to try and force an unnatural corridor through the Van Allen Belt... Unfortunately, the radiation levels actually got worse, not better. What they created was a third belt that was 100 times more intense than the natural belts, and as estimated by Mary Bennett in 'Dark Moon - Apollo and the Whistle-Blowers, by 2002 this artificial zone will still have 25 times more radiation than the other 2 belts. There is no agreement to how wide these radiation belts actually are. Dr James Van Allen, the discoverer of the belts estimated that they were at least 64,000 miles deep, but NASA say they are only 24,000 miles deep. Each Apollo craft spent approximately 4 hours within the belts. One of the worst sun flares ever recorded happened in August 1972, which was between the Apollo 16 and 17 missions. This single flare would have delivered 960 rem of virtually instant death to any astronaut who was up in Space, and yet all of the Apollo astronauts were carrying out their missions in what amounts to nothing more than a thick linen suit. These pressure suits may have helped protect the astronauts against heat or micro meteorites, but certainly would not have given any radiation protection. By the way, there is no known method of registering when and how strong Solar flare activity will be. So, rather like hitting a bingo jackpot,I guess NASA just struck lucky! The radiation would have greatly affected the film that was shot on the Moon. Physicist Dr David Groves Ph.D., has carried out radiation tests on similar film and found that the lowest radiation level (25 rem) applied to a portion of the film after exposure made the image on the film almost entirely obliterated. Why didn't that happen to the Apollo films? Readers will be interested to hear that the biggest Solar Flare for 25 years was recorded in April, 2001. So sceptics who are claiming that NASA know when the Solar Flares are going to appear are talking rubbish - as usual. If this were the case, why didn't they bring down the astronauts from the Shuttle and ISS if they knew this gigantic Solar Flare was about to erupt? Probably the most convincing argument however about the dangers of radiation to astronauts comes from NASA themselves. Read this report made on 8th September, 2005. It makes very interesting reading, especially when you have a number of sceptics like I have breathing down my neck trying to claim otherwise! How much radiation awaits lunar colonists? September 8, 2005: On the Moon, many of the things that can kill you are invisible: breathtaking vacuum, extreme temperatures and space radiation top the list. Vacuum and temperature NASA can handle; spacesuits and habitats provide plenty of air and insulation. Radiation, though, is trickier. The surface of the Moon is baldly exposed to cosmic rays and solar flares, and some of that radiation is very hard to stop with shielding. Furthermore, when cosmic rays hit the ground, they produce a dangerous spray of secondary particles right at your feet. All this radiation penetrating human flesh can damage DNA, boosting the risk of cancer and other maladies. Above: The surface of the Moon is exposed to space radiation. According to the Vision for Space Exploration, NASA plans to send astronauts back to the Moon by 2020 and, eventually, to set up an outpost. For people to live and work on the Moon safely, the radiation problem must be solved. To carefully measure and map the Moon's radiation environment, NASA is developing a robotic probe to orbit the Moon beginning in 2008. Called the Lunar Reconnaissance Orbiter (LRO), this scout will pave the way for future human missions not only by measuring space radiation, but also by hunting for frozen water and mapping the Moon's surface in unprecedented detail. LRO is a key part of NASA's Robotic Lunar Exploration Program, managed by the Goddard Space Flight Center. One of the instruments onboard LRO is the Cosmic Ray Telescope for the Effects of Radiation (CRaTER). 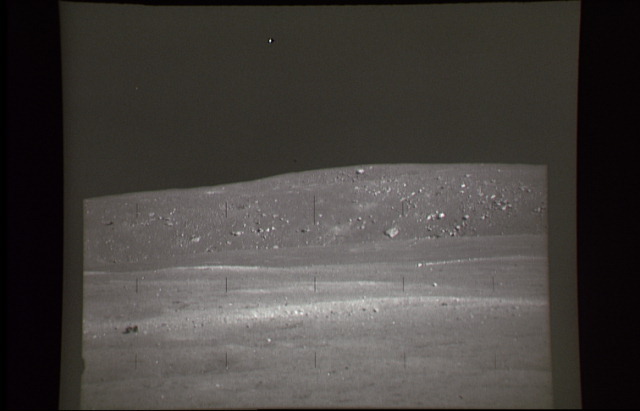 By placing the radiation detectors in CRaTER behind various thicknesses of a special plastic that has similar density and composition to human tissue, Spence and his colleagues will provide much-needed data: Except for quick trips to the Moon during the Apollo program, most human spaceflight has occurred near Earth where our planet's magnetic field provides a natural shield. In low-Earth orbit, the most dangerous forms of space radiation are relatively rare. That's good for astronauts, but it leaves researchers with many unanswered questions about what radiation does to human tissue. CRaTER will help fill in the gaps. Out in deep space, radiation comes from all directions. On the Moon, you might expect the ground, at least, to provide some relief, with the solid body of the Moon blocking radiation from below. Not so. When galactic cosmic rays collide with particles in the lunar surface, they trigger little nuclear reactions that release yet more radiation in the form of neutrons. 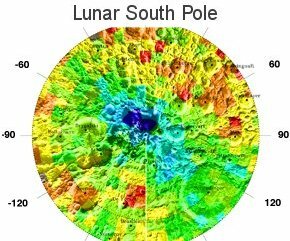 The lunar surface itself is radioactive! So which is worse for astronauts: cosmic rays from above or neutrons from below? Igor Mitrofanov, a scientist at the Institute for Space Research and the Russian Federal Space Agency, Moscow, offers a grim answer: "Both are worse." Mitrofanov is Principle Investigator for the other radiation-sensing instrument on LRO, the Lunar Exploration Neutron Detector (LEND), which is partially funded by the Russian Federal Space Agency. By using an isotope of helium that's missing one neutron, LEND will be able to detect neutron radiation emanating from the lunar surface and measure how energetic those neutrons are. The first global mapping of neutron radiation from the Moon was performed by NASA's Lunar Prospector probe in 1998-99. LEND will improve on the Lunar Prospector data by profiling the energies of these neutrons, showing what fraction are of high energy (i.e., the most damaging to people) and what fraction are of lower energies. With such knowledge in hand, scientists can begin designing spacesuits, lunar habitats, Moon vehicles, and other equipment for NASA's return to the Moon knowing exactly how much radiation shielding this equipment must have to keep humans safe. H. J. P. Arnold is an astronomer and keen photographer, an expert on space and astrophotography and was the assistant to the Managing Director at Kodak during the Apollo years. He has authored many space photography books. He comments that the film that was supplied by Kodak for the missions was essentially the same as used here on Earth. it was ektachrome 64 ASA or ISO as it is called today. He has commented that you would expect to see some small dots on the films where a high velocity nuclear particle had hit the film, however no evidence of this whatsoever has come forward. The only thing that would protect the film from this damage would be a thick layer of lead around the camera casing, which according to Hasselblad was not used. Let's also remember that the films were changed whilst outside on the Moon's surface and not in a controlled environment. One of the main anomalies that leads me to believe that the Moon footage was taken on a film set is the fact that the same mountains appear on different Apollo missions which are supposed to be landed several hundreds of miles from each other. 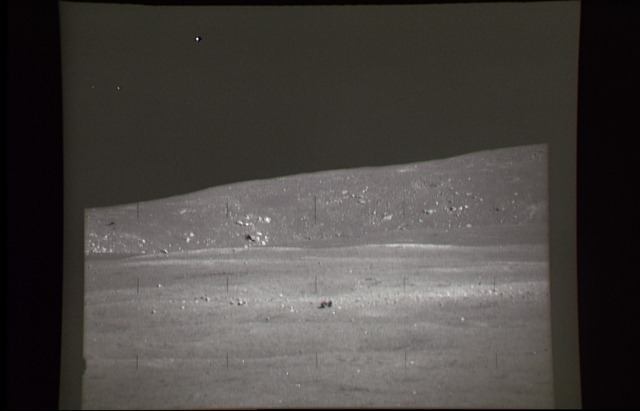 In the following sequences you will even see the camera pan across the landscape that at one point includes the Lunar Landing Module. In another shot from the same mission, we see the very same mountains, but no Lander? How can this be when the mountains appear to be exactly the same distance away from the camera? This film shows two different Apollo missions, which are supposed to be in different areas of the Moon, but show the exact same mountains in the background. I possess an Apollo film documentary called 'Apollo: One Giant Leap For Mankind' which features all of the Space missions from before the Apollo project right up until the Soyez-Apollo link up and the Shuttle. On this video during the Apollo 16 Mission we are told that the film to the left was shot during the first trip by the Rover to Stone Mountain, a trip that was carried out on 21st April and at 1 km west of the landing site... The second piece of footage to the right was taken the next day, at a site that was 4 km to the South of the landing site... What you can see in BOTH films is the same rocks. How can this be if the sites are several km's apart? It turns out that after some research, the two films were of the same EVA and was mistakenly labelled by NASA. Rather a lapse for such a company don't you think? One For The Sceptics Over the past few years I have been in constant debate with several members of the 'Bad Astronomy' website and Apollo believers who visit this site. Bad Astronomy is a website that is a general meeting place for people who think that they can explain the hoax theories concerning the Apollo program and the site goes into detail on other anomalies that appear on space footage. During my time debating on the site, I was issued several challenges by sceptics who said that if I could show 'official NASA footage' showing certain anomalies, then that evidence MAY make them think that something is definitely amiss with the NASA Apollo footage. Needless to say, as at the time of writing, none of them have come forward and changed their stance. 1. Produce pictures showing stars that are taken on the Moons surface. They say because of the very bright conditions on the Moon, stars would not be visible from its surface! 3. If I could provide film footage of the LEM producing a flame on the Moons surface (This would prove that the movie was not taken on the Moon because the Moons atmosphere and vacuum would prevent such a flame). One of the biggest debates between hoax theorists and sceptics concerns the non appearance of stars from the surface of the Moon. If the objects in the sky that appear in the film to the left from the Apollo 15 Mission are not stars what are they? We can rule out marks on the lens of the camera or in the film because these objects appear on various parts of each shot and not just in one place. Click on these pictures of Hill 305 and the Hadley Delta to see a larger view of 'stars' in the sky above the Moon. They all show a similar formation from different angles. These pictures are from a set (AS15-9012249 to AS15-90-12269) Most of this set shows 'stars' in the sky! Bad Astronomy writers tell me that a flame would not be visible on the surface of the Moon because it is a vacuum and has no atmosphere. We'll BA writers, watch the movie to the right. It shows the Apollo 16 LEM leaving the Lunar surface and what do we see... a flame Therefore this piece of footage alone proves that the Apollo program was hoaxed! The sceptics reading this article could perhaps explain why the movie to the left shows light suddenly increase when Armstrong is at the bottom of the steps before his first descent from the Lunar Lander? It certainly is not due to the light aperture being changed on the camera because only the light behind the lander alters and not the actual lander shadow. Its amazing how Armstrong, who at first is in complete darkness on the ladder, suddenly gets lit up when he is halfway down the ladder. Lets remember that there are no clouds on the Moon to obscure the Suns light! The cameraman doesn't move position by the way... Early in the footage you'll notice that the LEM managed to park itself in a bright light... how fortunate! That will take some explaining if artificial lighting wasn't used! CONCLUSION Lets try and put this all into perspective. Lets compare the Apollo cover-up with the USSR launch of the dog called Laika into space. She was launched into Space to see what the effects of Space travel would have on a live creature. It was publicly announced that Laika died painlessly when her oxygen supply ran out, but the truth was finally revealed many years later that the dog had in fact died when the front nose cone of the craft carrying her had been ripped off after reaching Earth's orbit and that the dog probably died from the intense heat of the Sun. Further investigations revealed that the nose cone had actually been designed to do this. So, in fact, the makers of the rocket had known that the dog would die even before she was sent into space... this evidence took 30 years to be revealed to the general public. Also consider the recent revelation that Yuri Gagarin was not the first person to orbit Earth as first claimed by Russia. Thousands of people were employed to work on the Apollo mission, but very few people had access to the complete picture. By giving several people a small role in the missions meant that they would not see the whole project. Some of the Eleven Apollo astronauts had non space related fatal accidents within a twenty two month period of one another, the odds of this happening are 1 in 10,000...coincidence? James B. Irwin (Apollo 15) resigned from NASA and the Air Force on July 1, 1972. Don F. Eisele (Apollo 7) resigned from NASA and from the Air Force in June 1972. Stewart Allen Roosa (Apollo 14) resigned from NASA and retired from the Air Force in February 1976. How did man manage to collect the rock samples if we didn't go to the Moon??? 750 lbs or so were said to be collected on the Apollo missions. This maybe so, but according to official NASA records, only a couple of pounds were actually collected by the astronauts. It would not be impossible to irradiate a rock or put it in a vacuum to get the same results. Did you know that two years before the Apollo 11 mission, its lead scientist Dr. Werner Van Braun made a trip to Antartica which is a prime area for collection Moon rocks? Why hasn't anybody spoken out about the cover-up? They have. Bill Kaysing got in touch with his friend, a private investigator from San Francisco called Paul Jacobs, and asked him to help him with his Apollo anomalies investigations. Mr. Jacobs agreed to go and see the head of the US Department of Geology in Washington, as he was travelling there the following week after his discussion with Mr. Kaysing. He asked the geologist, 'Did you examine the Moon rocks, did they really come from the Moon.?' The geologist just laughed. Paul flew back from Washington and told Kaysing that the people in high office of the American Government knew of the cover-up. Paul Jacobs and his wife died from cancer within 90 days! Check out the film documentary at the top of this page showing NASA employees talking about how they were instructed to airbrush out anomalies on the Moons surface. Why would NASA fake the Apollo Mission? I think the main reason why the US Government and NASA faked the 'official record' is because they could not be seen to be the weak link, especially when you consider that during the 60's, the USA were at the height of the Cold War with Russia. Also their own President had forecast that before the end of the 60's Man would be on the Moon. It would be better to try and fool the public and hoax the footage, rather than let their biggest rival in the World strike a huge moral victory by beating them to the Moon. If man really went to the Moon, why did NASA drop the successful Saturn 5 launch rocket after the last Apollo mission? The shuttle weighs 3/4 heavier than the Saturn 5 Rocket, puts only 1/6th of cargo weight into orbit and costs 3 times as much to launch. The shuttle is basically a glider with no escape for the crew if things go wrong (as we all know they do). Why scrap a rocket that can outperform its newer model? The Shuttle was first flown 2 years behind schedule. NASA could have easily launched the Shuttle on top of the second stage of the Saturn 5 rocket? The first stage would have dropped into the Ocean and the second stage and the fully loaded shuttle orbiter would have travelled into low Earth orbit. The second stages could have then been left in orbit and assembled to make the Space Station, which would have been well on its way to completion by the time the Shuttle was first launched in 1981. They could have had the first launch of the shuttle a whole 5 years before it was finally launched and saved the American taxpayer 20 billion dollars. Why didn't Russia even bother to land a cosmonaut on the Moon after the Americans beat them to it??? Russia were ready to launch their own craft just one month after the success of the Apollo 11 Mission - so why did they scrap their lunar program? Many people would say that its because it was too late, but if you want to look at it like that, why didn't this apply to NASA when the Russians beat America in putting the first satellite, animal, man, woman and space station into orbit? Russia would not have thrown in the towel just because America had beaten them at one single thing in Space! Not one thing that appears on the surface of the Moon had to be placed by Man. Be it mirrors to reflect lasers from here on Earth to calculate distances or seismology equipment. All could have been placed there by robotic machines. It wouldn't necessarily need a human to place them there. During Project Apollo, six highly complex manned craft landed on the Moon, took off and returned to Earth using a relatively low level of technology. An 86% success rate. Since Apollo, twenty five simple, unmanned craft with increasingly higher levels of technology have attempted to fulfil their missions to Mars. Only seven succeeded. Russia have, and continue to have unmanned craft launch into space. Their project worked more towards first sending an unmanned lander to the Moons surface to collect samples, take pictures and measure radiation levels. Why did NASA not even send an unmanned craft to the Moons surface before risking human lives? Basically, The mission was a cold-war bluff to get the soviets to think that we were more advanced than they were. It is just like a poker bluff where you want it to look like you are holding the stronger hand. I this case the soviets decided to fold. WATCH THIS GREAT PIECE OF FOOTAGE.. Since it only took 8 years from President Kennedy's announcement till the first mission, why would it take 23 years to send man back to the Moon for the 7th time? In 1999 this estimate changed. Douglas Cook, Director of the Exploration Office at Houston's Johnson Space Centre calculated that Man could go back to the Moon within 100 years.... I'm not holding my breath!!! I receive several letters from Apollo believers on an almost daily basis telling me that I'm completely wrong, however, consider this. The distance that Man allegedly had to travel to get to the Moon was the equivalent of 30 Earth diameters. Now compare that with the greatest distance that Man has travelled since then (in the Shuttle) which is 400 miles. That is the equivalent of just 1/2 an inch from the Earth compared to the distance travelled to the Moon. Von Braun said in his book 'Conquest To The Moon' (published in 1953) that it would be impossible to send anyone to the Moon because of the sheer size of craft needed to do the trip. In fact, taking Von Braun's calculations into consideration, a spaceship that needed to travel that distance would have had to be 266 times bigger than the Saturn 5. Also consider the recent announcement from NASA that it would take scientists 15 years from now to design and build a craft to go back to the Moon. Why when we have allegedly been there 6 times already? J. F. Kennedy announced in 1962 that Man would travel to the Moon by the end of the decade. Just 7 years later Man allegedly did just that. But more than 35 years later in a World that is vastly technologically superior to the 1960's, why would it take over twice as long to do the same thing today? During the Apollo 11 mission a strange object accompanied the spacecraft whilst it was in space. Thinking that the object could be the S4B, a part of the rocket that had been unattached 2 days previously, they contacted Houston asking for the whereabouts of the rocket part. Buzz Aldrin: ‘Obviously, the three of us weren’t going to blurt out, ‘Hey Houston, we got something moving along side us and we don’t know what it is, can you tell us what it is? We weren’t about to do that, uhh, cos we know that those transmissions would be heard by all sorts of people and, uh, who knows what someone would have demanded that we turn back because of aliens or whatever the reason is…’ Houston, not knowing the situation reported back that the S4B was 6,000 nautical miles away from the Apollo craft. To this day, NASA have refused an official explanation for the object. Here's 33 things that need to be answered! 31) Film evidence has recently been uncovered of a mis-labelled, unedited, behind-the-scenes video film, showing the crew of Apollo 11 staging part of their photography. 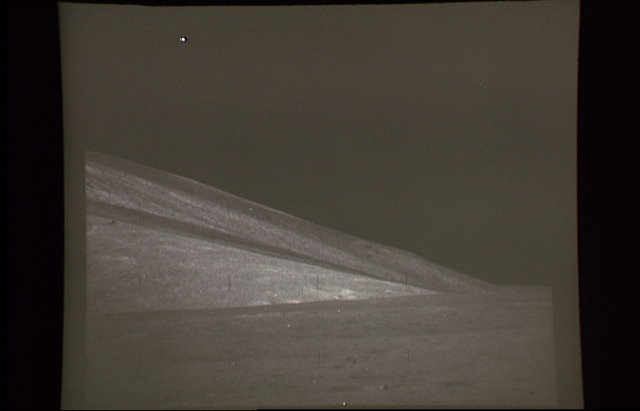 The film evidence is shown in the video "A Funny Thing Happened on the Way to the Moon!". and appears above in the 'Why Did Apollo 11 Astronauts Lie About Being In Deep Space?' section. 33) Why did NASA need to airbrush out anomalies from lunar footage of the Moon if they have nothing to hide? The Apollo mission was meticulously planned, yet there were still flaws in the plan which the public is being made aware of as time goes on. Unlike a simple game of bingo where nothing is planned and no strategy is involved the Apollo mission was thought out and at the time there seemed to be an answer to every question that arose. As times change and more research is being done on the mission the tables are beginning to turn and the public is starting to see the truth. Did Man go to the Moon? It's a contentious issue, considering how ridiculous the question might first appear. Despite the heaps of evidence available to us from NASA personnel, TV archives and museums (not to mention physically returned moon rocks), there is still a grumbling doubt that the whole thing might just have been made up. The movie 'Capricorn One', where fictitious American astronauts were removed from their rocket and driven to a film set in the desert to record their Moon landing, has a deep and lasting resonance with me. It could have been faked, even if the Apollo astronauts really did actually walk on the surface of the Moon. 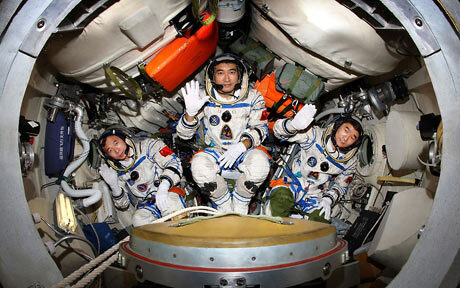 Such doubt is compounded by the news this week that China's official news agency Xinhua published a long and detailed account of the spaceflight of Chinese astronauts, including dialogue, while the Shenzhou VII rocket was still sat on the launchpad! Of course, this might have been the work of an over-enthusiastic State journalist, whose copy needed to read and re-read by the Patriarchs who run China before release to the joyous masses. Time may have been the feature here, rather than a deliberate effort to deceive. After all, in the absence of a free press, Communist editing is a time-consuming business. But it highlights a deeper issue. How do any of us actually know what goes on in space? Only from what we're told, through official space agencies. They control the news, and so can control the truth. Spacecraft and satellites can be tracked by amateurs, whose telescopic equipment is often highly advanced. But the fact that a spacecraft is heading to the Moon might not necessarily mean that anyone's actually on board. The same applies to spacecraft orbiting the Earth. We can't be absolutely sure of anything that goes on up there, unless we go up there ourselves, like space tourists (a few of whom have now made the trip courtesy of the money-hungry Russian space agency). It is only when ordinary folk make the trip to space that this new frontier can be said to be completely open, and transparent. The Xinhua agency, which has sometimes been accused of carrying state propaganda, took down the story and blamed it on a "technical error". How convenient! If you are interested in obtaining more information about the Apollo missions and the anomalies that have been uncovered here, why not click on the banner below? Moonmovie.com has a great selection of thought-provoking DVDs that delve into the Apollo missions and shows the viewer why the missions must be faked. According to their investigations, all Apollo missions stayed in low-earth orbit for the duration of the trip. Moonmovie.com have uncovered some mis-labeled, unedited, behind-the-scenes footage from NASA that shows the crew of Apollo 11 clearly staging a shot of being half-way to the moon. This clip, shown in 'Apollo 11 Monkey Business' and explained in 'A Funny Thing Happened on the Way to the Moon', proves they did not leave low-earth orbit. Other DVDs available include Apollo Astronauts refusing to swear on the Bible that they went to the Moon (and Buzz Aldrin punching the investigator!). We can thoroughly recommend all the DVDs in the collection which we will be reviewing over the next few weeks - so stay tuned! PLEASE NOTE: A new updated version of this article is now in the process of appearing at our new site HERE. Over the next few weeks, this 5 part epic will be added to the site. Part One is available now - please click the link above after reading this article for the latest update. 'What happened on the Moon?' and the book 'Dark Moon - Apollo and the Whistle-Blowers' both authored by David Percy and Mary Bennett and available through Aulis Publications.